SUMMARY: We’ve reached 50% distance at Le Mans. Toyota leads overall, Alpine heads LMP2, Risi Ferrari is in front in GTE Pro and the Abu-Dhabi Proton Racing Porsche is continuing its strong run in GTE Am. 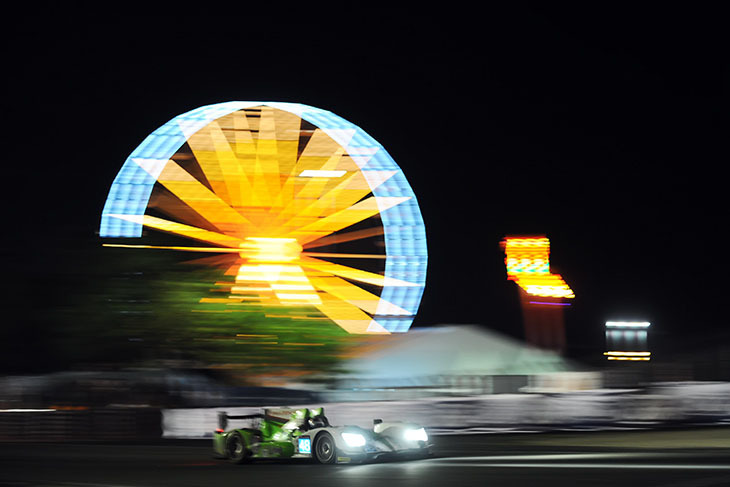 With Neel Jani making the break for the lead at the end of nine hours, the Swiss driver pulled away by a few seconds before making the #2 Porsche’s 11th stop. 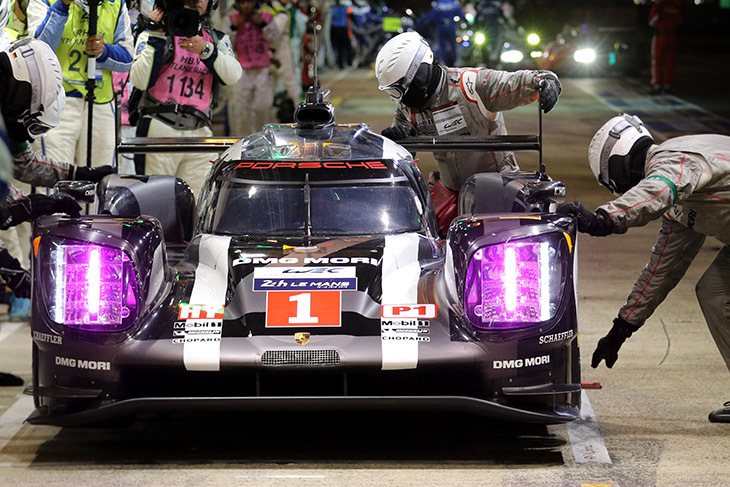 With 14 and three-quarter hours remaining, the #1 Porsche was being rebuilt to rejoin the race, Brendon Hartley eager to climb in and try to get back in the race. When it did emerge from the pit lane, 15 minutes later, Hartley was spotted running slowly down the Mulsanne Straight, at walking pace going through the Forza Chicane. It was straight back to the garage for Hartley, the mechanics having to repair the car further. It was believed to be a battery issue, but Porsche’s official line was that the mechanics changed the water pump. With the third safety car period in full swing, the gap at the front of the field had expanded after a three minute stop from the #2 Porsche. 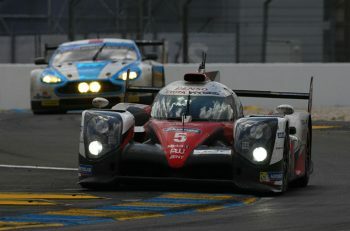 It left Toyota 1-2, with Conway in the #6 leading the race by two and a half minutes. When the race went green once again, Romain Dumas was all over the rear of Sébastien Buemi’s #5 Toyota for second spot, and made the move stick running down the Mulsanne, on a charge. Before the end of the lap it was clear that Dumas had the pace, gapping the Toyota by 2.7 seconds in sectors two and three. 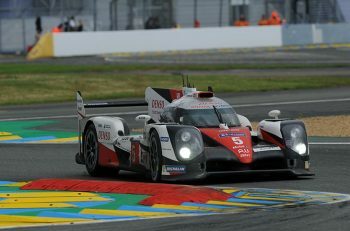 Dumas then turned his attention to the leading Toyota, and was lapping significantly quicker than Conway, reducing the gap to around the same amount of time as a standard stop. As the race reached 13 hours remaining it was still a three-way battle up front, with all those three still most definitely in with a shot. Conway still lead, his margin over Dumas standing at a reassuring 70 seconds, with Buemi falling back in third by more than 90. Jarvis held fourth and Fässler fifth in the #7 Audi. The #13 Rebellion was still sixth and in touch, albeit nine laps down on the leaver. Toyota #5 pitted at just after half-two, Buemi handing on to Anthony Davidson, rejoining in 3rd. Fässler pitted at the same moment, the two cars in the pitlane together (even if separated on track by several laps). The #7 Audi, pitting from fifth, promptly lost the position to Kraihamer’s Rebellion, only to regain it two laps later when the R-One also pitted. Shortly after, the #6 Toyota pitted from the lead, Kobayashi taking over from Conway, and emerging back on track in second, twelve seconds behind the #2 Porsche. 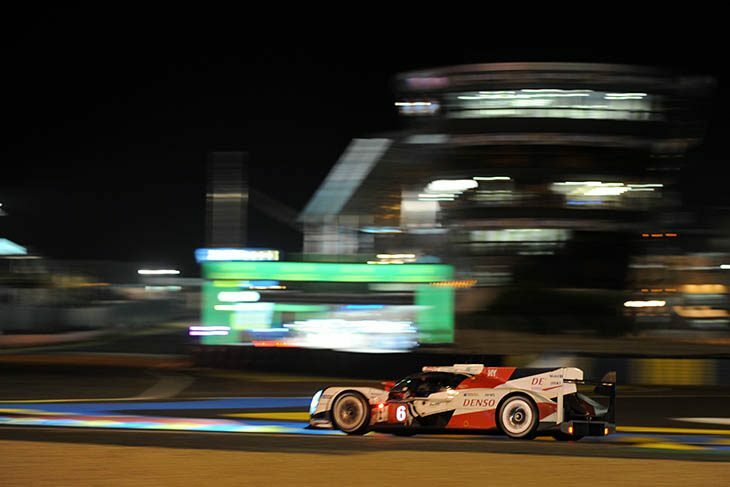 The second 919, #1, was still running at this stage, but some forty laps adrift, 49th overall, after a succession of problems. That wasn’t preventing Brendon Hartley from pushing hard though, and setting times on a par with the leaders. Drama then for the #7 Audi on the downslope beyond the Dunlop Bridge, with the car coasting to a halt on what would be the extension of the curve through onto the Bugatti Circuit. Fässler, having successfully regained 5th from Kraihamer, now lost it comprehensively. Coaxed back into life, the R18 started making a slow return to the pitlane. Stopping again intermittently, along the Mulsanne and again on the run round towards Indianapolis, all was evidently not well with the hybrid. It did eventually make it back to the pits, and then rejoined fairly rapidly, but the stop-start circulation had taken almost ten minutes. The race crossed the half-way point with Kobayashi in the #6 Toyota leading by 45 seconds from Dumas in the #2 Porsche and Davidson, third, in the second Toyota, the #5. The separation stood at a neat 100 seconds. Sunday and Hour 10 began with the race, certainly in LMP2, well settled into a rhythm, the #46 Thiriet by TDS Racing Oreca over a minute to the fore, now with Matthias Beche back in charge. Nicolas Lapierre was the pursuer, and enjoying almost double that margin over third-placed René Rast, although this largely thanks to an additional pitstop completed by the #26 G-Drive Ligier. After a fairly troubled start the Murphy Prototypes #48, seemingly always a favourite with the fans, was now making much better progress. A steady three-hour stint by Ben Keating had dragged the green and white #48 steadily up through the lower ranks from 51st to 45th. Bleekemolen then continued that recovery, hauling the car up to 40th. 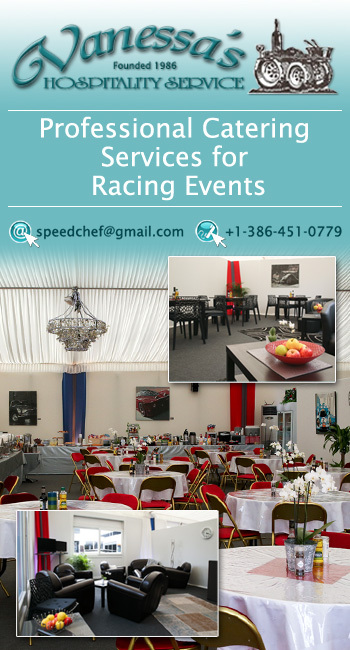 The race then progressed fairly uneventfully for half an hour, until the #47 encountered yet another problem in what was becoming a torrid race for the defending LMP2 champions. Having managed to get the car back after the earlier power outage, the #47 had dropped to 54th. Now, with Richard Bradley ran wide through the entrance into the Porsche Curves, the rear end slewing sideways and ending up well-buried in the gravel. The position was far from ideal, being close to what is a very fast racing line, and Bradley was seen to climb swiftly from the cockpit and run several yards from the car to take shelter behind the nearby marshal’s post. The initial concern was why Bradley had abandoned the car, unless he was convinced that something on the car had broken, causing the accident, and was beyond all hope of repair. Whatever his motivation, having run some thirty metres from the car, there was no doubt that the #47 KCMG would soon become the second official retirement, and the first from LMP2. 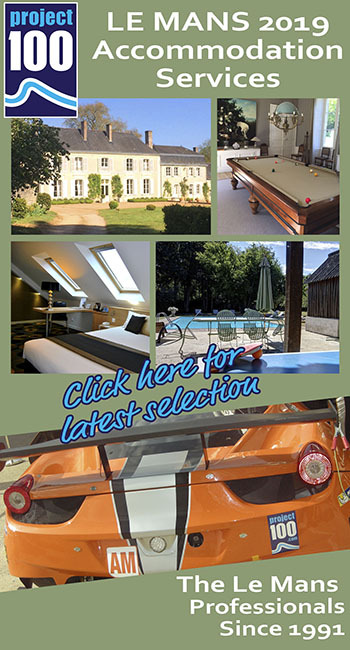 We subsequently learned that the car had been having battery problems for some time, which accounted for the earlier issue along the Mulsanne. As Richard Bradley came into the Porsche Curves the power steering failed, he lost control and beached the car in the gravel. He knew that, without power, he’d never be able to re-start the car, and so abandoned it. The fact that there was still pace in the track came at ten to one, when Jonny Kane set a new fastest lap for the #42 of 3:41, but nobody was going to match that for some while, because the #91 Porsche promptly dumped the entire oily contents of the sump across the track, appropriately through the Porsche Curves. The works 911 RSR coasted to a noisy halt, Kévin Estre having no choice but to pull over at the side of the track and await recovery. Race Control was swift to react, and the safety cars were despatched, but not before a couple of followers were caught out by the oil, including Andrea Pizzitola in the #25 Algarve Pro Racing Ligier, slithering sideways into the gravel. It took the marshals some while to treat the oily waste, scattering so-called “cement dust”, but actually a specific oil-neutralising compound, across the affected track. Racing resumed at 01:26, with several cars pitting just before the safety car peeled away, including Rast in the #26 G-Drive and Cheng in the #35 Baxi DC Ligier. The end of the hour revealed several P2 drivers setting some of their quickest times of the race so far, including Rast (#26) and Kane (#42). The class order was: Menezes leading for #36 Signatech Alpine (but short one pitstop) from Rast in the #26 G-Drive car, Beche in the #46 Thiriet by TDS and Dennis in the #38. Just after two came notification that Erik Maris in the #22 So24! 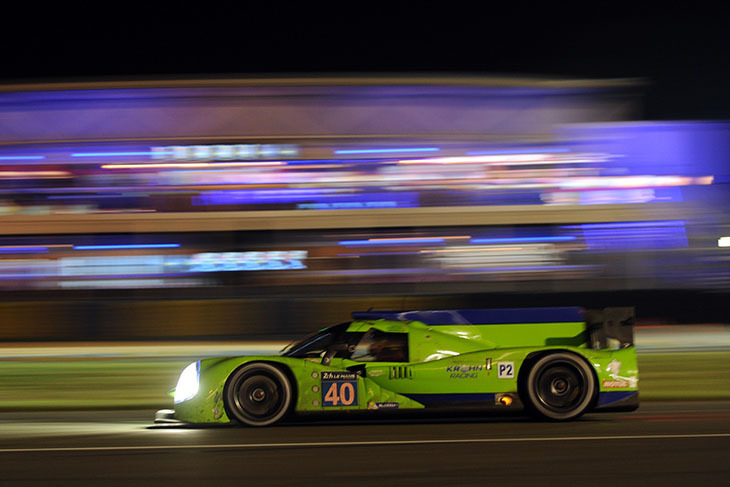 Ligier was to be penalized with a one-minute stop-go for speeding through a slow zone. Five minutes later it was declared that the car’s previous pitstop was also under investigation. Whatever the oputcome, it would have little bearing on the race, as the car was already running 47th. A more significant change in order did come shortly afterwards through, but only thanks to pitstops. Menezes and Ladygin both made stops for fuel, the former from the lead (as expected), and the latter, in the #37 SMP Racing BR01, from sixth. Rast moved through to become the class leader again, now with an advantage of 28 seconds over Beche. At 02:45 the long-anticipated pitstop for Menezes materialised, with the #36 Signatech Alpine completing its 16th stop for fuel, but no driver change on this occasion. Talking of pitstops, the #40 Krohn Racing Ligier had earned a penalty drive-through for starting the engine while the crew was still refuelling. Not the ‘done thing’. Meanwhile, more dramas for the #34 Race Performance Ligier, off across the gravel and into the tyre wall at what appeared to be the Mulsanne Corner. This aside, and accepting a succession of regular pitstops, there wasn’t much to report from P2. Just before the end of the twelfth hour Matthias Beche pitted the #46 from second, then hand-over the Hirakawa taking just long enough to allow Will Stevens through from third. That left Menezes still leading for Signatech, from Stevens (G-Drive) and Hirakawa third. Olivier Pla wasted no time in getting his #66 Ford GT dug in at the green flag, jumping Fernando Rees’ #97 Aston Martin and drawing away in fifth place in GTE Pro. 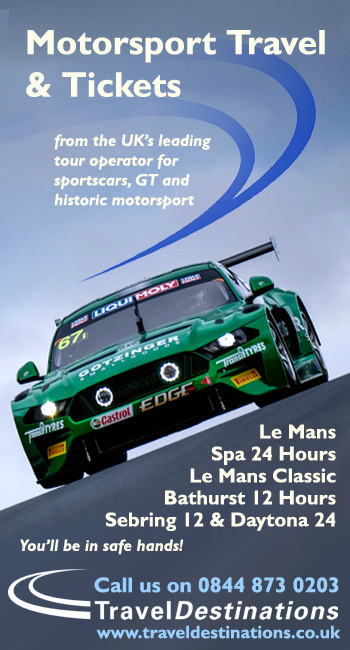 Rees started to respond, though, dialling in some quick sector times as a reminder that the Astons were working to a plan and shouldn’t be disregarded this early – Nicky Thiim still held a fairly lonely fourth place in the #95 car, lapping consistently in the 3:55s. With the top two GTE Pros now into the overall top 20 runners, things were fairly static at the front. The Am position had also become much more strung out after the Safety Car. Pat Long’s efforts at the front had been more than helped by the intervention, the #88 Proton Porsche now enjoying a cushion of more than two minutes over Bill Sweedler’s Scuderia Corsa Ferrari, before he pitted the #82 entry routinely and rejoined at the wheel for a double stint. Paul Dalla Lana’s luck was showing no sign of improvement, his Aston Martin snapping left into the barrier between Indianapolis and Arnage. The beneficiary of this was the #55 AF Corse Ferrari, which now found itself third, Duncan Cameron doing a solid job. Heinemeier-Hansson jumped back aboard the leading Porsche at this point. The Risi Ferrari took a routine stop and narrowly beat the #95 Aston to the end of the pitlane to retain its second place, Vilander staying aboard. Dirk Muller’s lead in the Pro class looked comfortable, the car maintaining a sound pace and a lead of over two minutes. Muller stayed aboard at his next routine stop, taken just as the #91 Porsche’s engine let go in a big way, dropping oil on the entry to the Porsche Curves and prompting another safety-car period. At this point the #66 Ford was brought in from eighth position, frantic activity focused on the rear of the car. Rob Bell had stayed aboard the Clearwater Ferrari to gain a few seconds before Aaron Scott took his turn in the #55 AF Corse Ferrari. Any prospect of a stand-off between them for third though was postponed as Scott took to the pits again under the safety car to take on fuel and put the Ferrari out of sequence. The net result of the stops in Am was Scott resuming in fifth behind the #83 AF Corse Ferrari, which had done well to rise back up the order after Francois Perrodo’s earlier off with veteran Emmanuel Collard now at the helm. Also in Am, Wolf Henzler’s evening was starting to look shaky: the #78 KCMG car that had run hard at the front earlier in the race was pit-bound and dropping out of the class top 10. After 28 minutes under the safety car, the mess from the Porsche’s engine failure was cleared and the race went back to green. With just over 13 hours to go, the #71 Ferrari’s troubles were added to by Davide Rigon ending up in the gravel at the Esses. The car was immediately shown as ‘stopped’ on the timing screens, and later confirmed as a retirement, the cause a wheel rim failure. Up front, Vilander was enjoying a lead of around a minute on Westbrook’s Ford, after the latter had been held at the exit of the pitlane during the safety car period and thus being picked up by a different safety car to the Risi Ferrari. There was steady progress, meanwhile, from the #95 Aston, which was handed from Thiim to Sorensen, and the the #64 Corvette, now in fifth in class in the hands of Tommy Milner. Another routine stop for the #82 Ferrari saw Vilander cede to Malucelli, while the #69 Ford stopped almost simultaneously to allow Westbrook hand over to Briscoe. Approaching half-distance, the GTE Am-leading #88 Porsche was brought in by Heinemeier Hansson and handed over to Khaled Al-Qubaisi, while their rivals in the #62 Ferrari also stopped, although Townsend Bell stayed on board.